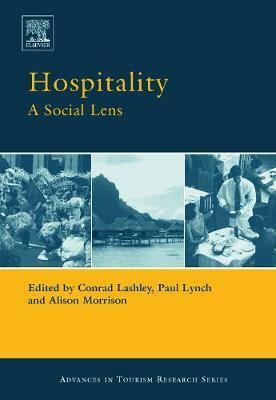 Hospitality: a social lens follows on from the unique contribution made by In Search of Hospitality: theoretical perspectives and debates. It progresses debate, challenges the boundaries of ways of knowing hospitality, and offers intellectual insights stimulated by the study of hospitality. The contributing authors provide tangible evidence of continuing advancement and development of knowledge pertaining to the phenomenon of hospitality. They draw on the richness of the social sciences, taking host and guest relations as a means of studying in-group and out-group relations with and between societies. The chapter contributors represent a multi-disciplinary, international grouping of leading academics with expertise in hospitality management and education, human resource management, linguistics, modern languages, gastronomy, history, human geography, art, architecture, anthropology, and sociology. Each lends their expertise to apply as a social lens through which to view, analyse, and explore hospitality within a range of contexts. Through this process novel ways of interpreting, knowing and sense-making emerge that are captured in the final chapter of the book, and have informed future research themes which are explored. Chapter 1: Hospitality: an introduction (C. Lashley, P. Lynch & A. Morrison); Chapter 2: Dimensions of hospitality: exploring ancient and classicical origins (K. O'Gorman); Chapter 3: Transgressing Hospitality: polarities and disordered relationships? (C. Sheringham & P. Daruwalla); Chapter 4: Hospitality and Gastronomy: Natural Allies (B. Santich); Chapter 5: Hospitality and Tourism in Ngadha: an Ethnographic Exploration (S. Cole); Chapter 6: The Role of the Hospitality Industry in Cultural Assimilation: a Case Study from Colonial Australia (B. O'Mahony); Chapter 7: Hospitality and Urban Regeneration (D. Bell); Chapter 8: The Commodification of Hospitality Space (A. Wharton); Chpater 9: Commercial Home Enterprises: Identity, Space and Setting (M. Di Domenico & P. Lynch); Chapter 10: Inhospitable Hospitality? (G. Ritzer); Chapter 11: The Power of Hospitality: A Sociolinguistic Analysis (P. Lynch & M. Robinson); Chapter 12: Opening Pandora's Box: Aesthetic Labour and Hospitality (D. Nickson & C. Warhurst); Chapter 13: Ways of Knowing Hospitality (C. Lashley, P. Lynch & A. Morrison). Professor Conrad Lashley is Professor of Leisure Retailing at the Centre for Leisure Retailing at the Nottingham Business School. His research interests have largely been concerned with service quality management, and specifically employee empowerment in service delivery. He works closely with several major industry organizations including the British Institute of Innkeeping, J. D. Wetherspoon and McDonald's Restaurants Limited. She has an MSc in Entrepreneurial Studies and her Ph.D. thesis investigated small firm strategic alliances. Since 1979 she has been an entrepreneur in her own right, owning and operating a number of restaurant and hotel businesses. In addition, she regularly undertakes consultancy projects for entrepreneurs both in the UK and internationally.